I didn’t do Watch Me Wednesday this week. I’m sure someone will be disappointed, but I couldn’t ramble on for several minutes this week. I just didn’t have a topic I felt like talking about. So SKIPPED! 🙂 Maybe next week… I keep telling you to give me ideas! Here’s my expert photoshop skills utilized to get all of us into one photo because I was certain some stranger would steal my dSLR and I refused to risk it. 😉 Noah took a photo with Sarah, Mike, and I in it. I took a photo with Noah and Amber in it. I pieced them together. Awesomeness resulted. 1) Wow! My hair was long! 2) My PS skills are definitely awesome. 3) NYC. You and I WILL meet again. Soon. I can feel it in my bones. 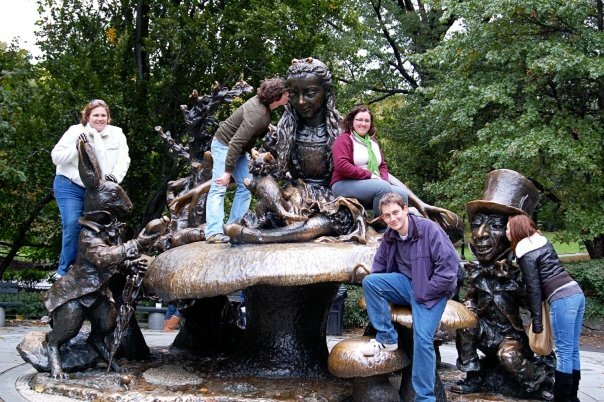 This entry was posted in Throwback Thursday and tagged alice in wonderland, friends, memories, new york, new york city, nyc, project 365, statue, throwback thursday, travel, trip. Bookmark the permalink.